W.S. Mount Elementary School sixth graders in the Three Village Central School District put their creative talents to support a local food pantry whose supplies were running low. Working as a grade level, the students created inspirational bookmarks to sell during lunch periods. 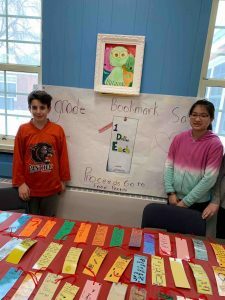 The students took turns setting up the table with the beautifully decorated, laminated bookmarks and sold them to their peers. In one week, the students had raised $700 to purchase supplies for the food pantry. Photo caption: W.S. 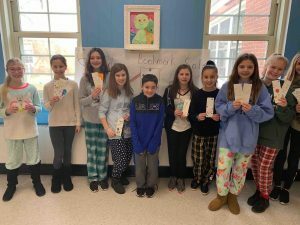 Mount Elementary School sixth-graders sold inspiration, original bookmarks to raise money to support the work of a local food pantry.